The makers of the Harman pellet furnace, the Harman stove company based in Halifax, Pennsylvania, are well known for their pellet stoves and have used their knowledge of pellet burning technology to produce a hot air pellet furnace and two pellet boilers. 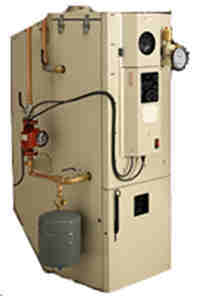 These are neat units designed to replace utility furnaces running on oil or gas. The Harman pellet furnace PF100 features a shaker handle to make cleaning the heat exchanger quick and easy. The standard wall controller has a light to warn when fuel is running low. The ash pan size allows two or three tons of pellets to be consumed before it needs emptying. 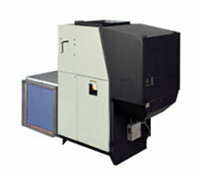 The PF100 can be used by itself or in conjunction with an existing furnace. Max. Heat Input 112,000 btu. Convection Blower Capacity 1,000 cfm., 1,500 cfm., 2,000 cfm. Warm Air Outlet Size 14 in. by 18 in. The Harman PB105 is a dedicated water boiler with the option of adding a domestic water heating coil. For ease of maintenance, the entire hopper hinges away from the main unit, giving good access to the burn pot and firebox. Max. Heat Input 113,900 btu. The Harman HydroFlex is a small unit useful for fitting where space is restricted and can connect to existing hot water or ducted air central heating systems. 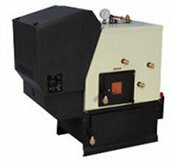 This neat Harman pellet furnace can be used by itself or in conjunction with an existing furnace. Max. Heat Input 60,000 btu. Hopper Capacity 160 lbs. A bulk hopper is available as an option and holds 1,400 lbs. Faster ignition & recovery for quick response to heat needs. 14 spiral baffled stainless heat exchanger tubes increase efficiency. Front door with window for easy ash removal, burnpot access and fire viewing.